“This is truly one of those wonderful family traditions for so many people,” said Woolaroc CEO Bob Fraser. “We have families who meet here at Woolaroc each year to celebrate their ‘family Christmas’ during our lights. 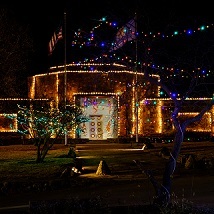 In addition to the lights, we have wagon rides, live entertainment, Santa Claus in the Museum, hot cider/hot chocolate and cookies for sale in the Lodge; and, if you are lucky, you may catch a glimpse of the Holiday Horseman, covered in lights, riding across the grounds. To have the chance to walk the grounds as holiday music drifts through the trees, enjoying the lights, hearing the laughter of children – this is the way things should be this time of year,” said Fraser.